Minidutch director Lucia Fabio has always been particularly good at thinking through her gallery’s raison d’etre with every exhibition she presents. Each show at this Chicago-based alternative space not only offers a window into the thinking processes of the artists she features (minidutch tends to focus on works that are in-progress and/or in process, as in last month’s Dusty Bunnyfield vs. Molotovia Cottontail exhibition), but also explores different aspects of alternative exhibition making. As such, minidutch is something of a self-reflexive endeavor, one which provides open-ended exhibition opportunities for artists while at the same time bringing viewers’ focus back to the specific contexts in which that work is being considered. So it seems wholly fitting that Fabio’s current exhibition presents a miniaturized and highly condensed, through-the-rabbit-hole view of Chicago’s alternative gallery scene at the same time that that scene is undergoing a much larger-scale survey at the Hyde Park Art Center with the Britton Bertran and Allison Peters Quinn-curated Artists Run Chicago. 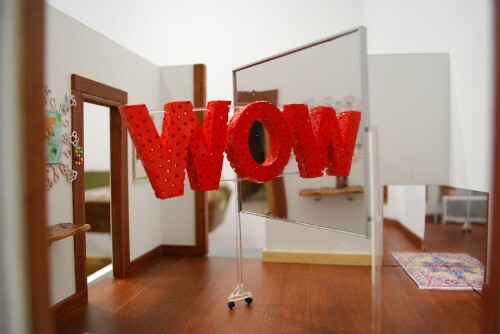 Last Saturday Fabio opened “Mini Fair,” which can be thought of as an eensy weensie, domestically-scaled counterpart to Artists Run Chicago. 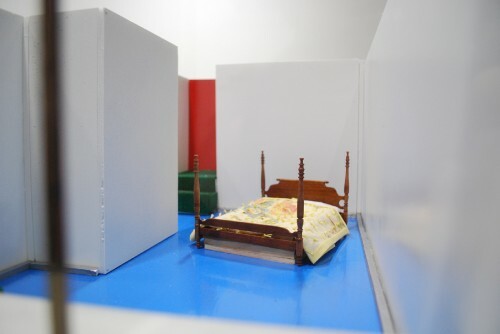 Fabio was joined by two other Chicago alternative galleries–The Swimming Pool Project Space and Floor Length and Tux (FLAT)–in creating miniature scale-model versions of their own spaces complete with diminutive artworks installed within. What I find fascinating about the way the miniature is evoked here is how concisely these toy-sized spaces embody all of the qualities for which alternative galleries (in Chicago and elsewhere) are both praised and subtly derided: their smallness of scale; their scrappy, no budget, d.i.y. sensibility; their location within the space of the home and the domestic (and, by extension, ‘the feminine’). I’m off to Hyde Park Art Center to see Artists Run Chicago. 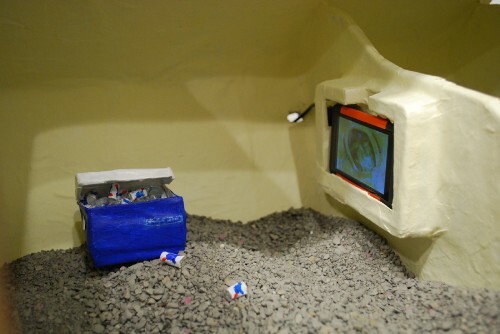 Below, a few images from “Mini Fair.” Look especially closely at the floor material in FLAT’s space — it’s kitty litter! Minidutch. Installation by Chris Millar. Model built by Robert Andrew Mueller. The Swimming Pool Project Space. Installation by Mican Morgan. 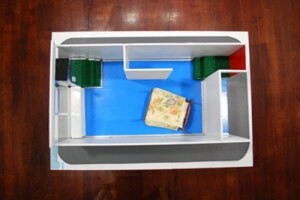 Model built by Liz Nielsen. Floor Length and Tux (FLAT), Model built by EC Brown and Catie Olson. Floor Length and Tux (FLAT), interior detail. 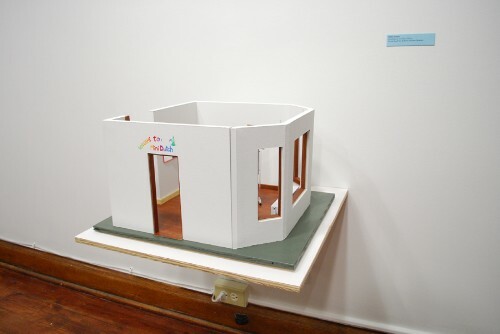 Model built by EC Brown and Catie Olson. 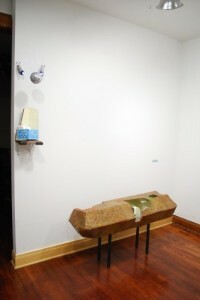 Before leaving Chicago, Lucia Fabio & Robert Andrew Mueller share their sculpture “Mattress Bunny” @ Zolla/Lieberman Gallery, 325 W. Huron; opening tomorrow, Friday, June 19, 2009, from 5:00 pm to 9:00 pm. The show is scheduled to run until August 20, 2009. Aside from her own artwork, and mini dutch, Fabio was one of the [unpaid] volunteers [along with Rachel Wakeman et al] who really gave life to the threewalls exhibition space. Good people; loss to the City.